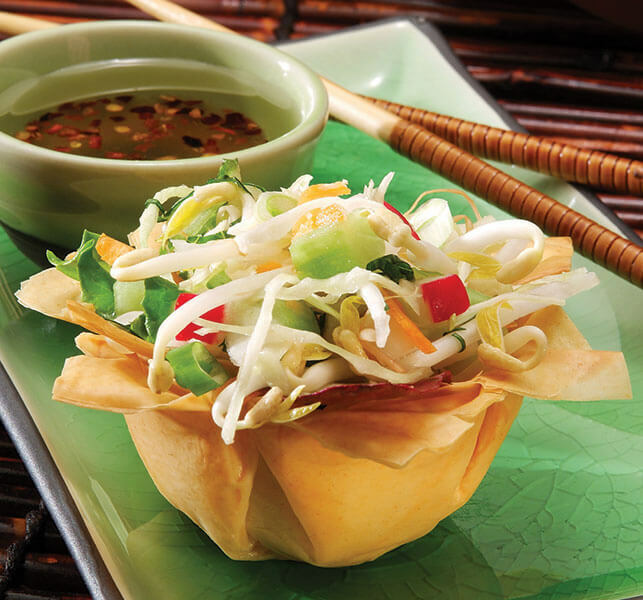 Flaky Phyllo tarts add extra excitement to this light Thai salad that serves as a perfect first course. In a large bowl combine cabbage, baby greens, bean sprouts, radishes, green onions, cucumbers and basil mixing lightly. In a small bowl, whisk together vinegar, canola oil, honey and red pepper flakes. Drizzle dressing over vegetables and toss to coat evenly. Chill 1 hour. In a small saucepan, melt butter with olive oil. Layer 5 Phyllo sheets, brushing each with the butter-oil mixture. Cut six 4-inch circles from layered Phyllo. Lightly brush 3” muffin pan with butter-oil mixture. Place circle into the muffin pan. Carefully push Phyllo into cup, pressing firmly against bottom and sides. Repeat process 3 times to make 24 tarts. 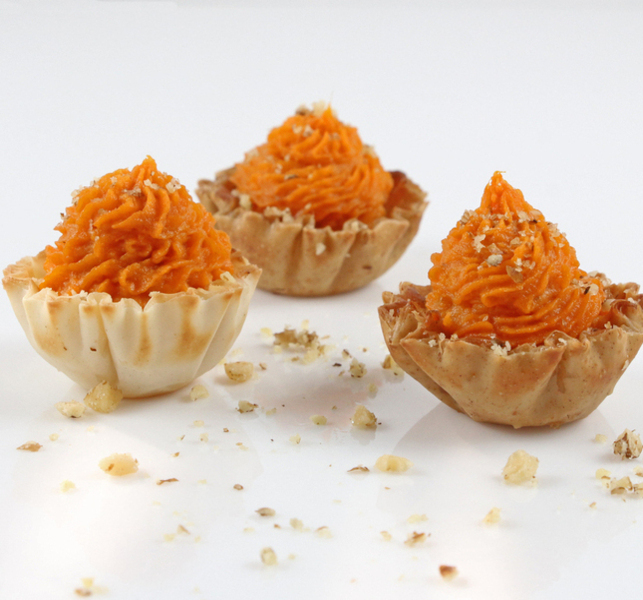 Bake Phyllo cups in a preheated 3501/4F oven for 8 – 10 minutes or until golden. Cool 5 minutes and remove from pan. Spoon 3 tablespoons of vegetable mixture into each Phyllo tart. Garnish with cilantro leaves. Serve chilled. 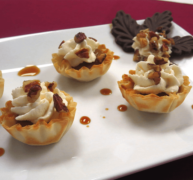 With a sweet filling flavored by thickened, condensed milk and maple syrup, these Mini Phyllo Shell desserts become even more tempting when topped with whipped cream and toasted pecans. It’s easy to make Thanksgiving appetizers that can go well with other items on your holiday menu. Compliment your green beans, bacon biscuits, spiced smoked ham and maple-glazed turkey with a wide range of easy-to-make Thanksgiving appetizers that will satisfy guests’ diverse tastes.